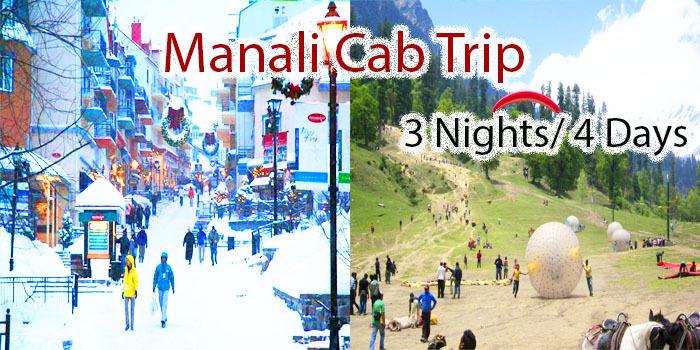 Day 01: Start your journey from Delhi- Pick up you from Delhi Airport and drive to Manali by private cab overnight journey. Day 02: Reach Manali Reach Manali Check in the hotel and some leisure Get ready for .Manali Local Sightseeing Manali “HADIMBA TEMPLE” Built in 1553 with a superbly crafted four tiered pagoda roof, it is famous for its exquisitely carved doorway .“CLUB HOUSE” The Club House with its comprehensive facilities that include a roller skating rink, an auditorium, billiards rooms, a library, a bar and restaurant makes wonderful outing for the day.” Tibetan Monastery, Van Vihar, and “VASHIST” Well known for its hot springs. There are old temples dedicated to the sage Vashisth and to Lord Rama. Overnight stay in hotel at Manali. Day 03: Head to Solang Valley and slide over the Rohtang Pass Top Slopes After breakfast at the hotel and later get ready for an excursion to visit Solang Valley / Rohtang Pass is outstandingly beautiful and is an ideal spot to view the majestic snow covered Himalayas, serene natural surrounding, pristine lake and fairy white snow round the year.vernight stay in hotel at Manali. Day 04: Head to kullu- Manikaran After breakfast and some leisure then visit Kullu market which is famous for its handicrafts and shawls. Collect some souvenirs from the market and Manikaran Gurudwara. And then in evening Return back to hotel take dinner and overnight stay. Day 05: Back to Delhi After breakfast and same leisure and Check out in the hotel. Then Drive back to Delhi Airport. Bid the tour good bye We Wish you a pleasant Holiday and thank for contacting IHD Hotels.Com For your Travel Needs..
1. Breakfast & Dinner in Every Hotel. 3. Accommodation of 01 in Hotel for 03 Nights. 1. Any Airfare, Train fare, Overland Journey which is not mentioned in the Itinerary. 2. Guide / Entry fees,rohtang pas entry fee, Boating, Elephant riding / Horse riding etc. 3. During sight seeing.Any personal nature items like Laundry, bar bills, table bills, camera fee, tips or any other item. 4. Room Heater in Hotel. 5. Any Medical /rescue evacuation due to mishaps. 7. Any other things that is not included in the “Package Cost Includes” Column.